This image was acquired by the Advanced Spaceborne Thermal Emission and Reflection Radiometer (ASTER) on NASA’s Terra satellite on October 27, 2012. It was made from a combination of near-infrared and visible light. In this type of false-color image, sand is tan and shadows are black or gray. The blue-tinted areas are likely mineral-rich evaporites. The image is centered at 29.8°north latitude, 7.9°east longitude, near the town of Gadamis. 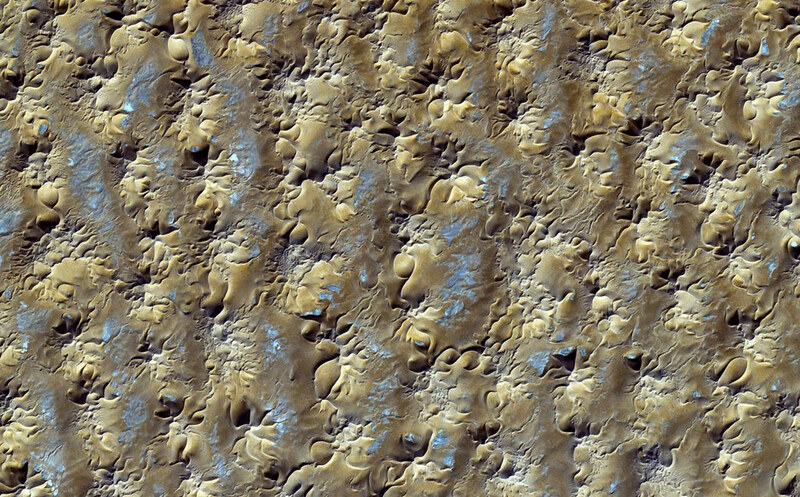 As is common with star dunes, some of the dunes have long interlacing arms connecting to nearby dunes. NASA image courtesy NASA/GSFC/METI/ERSDAC/JAROS, and U.S./Japan ASTER Science Team. Caption by Adam Voiland. Posted in Big Picture, Photography | tagged Algeria, desert, Earth, Earth from Space, NASA, nature, patterns, science, textures. The permalink.